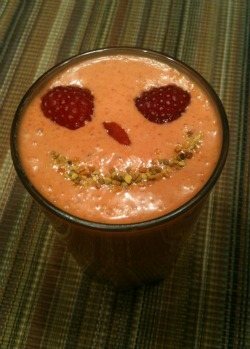 Prepare to smile when this delicious smoothie meets your taste buds. Goji berries are one of the first superfoods I tried, and I still consume them regularly today. These little red berries are loaded with nutrition. They are antioxidant powerhouses, a complete protein (contain 19 different amino acids and all 8 essential) source, rich in trace minerals, and high in beta-carotene. Goji’s are well known as an anti-aging and longevity food that supports a healthy immune system, good eye health, alkalinity and vitality, and are regarded as an adaptogen, meaning they help the body adapt to stress and other difficulties. They’re also quite versatile and most kids approve of them. Besides being a great smoothie ingredient, goji berries go well in salads, trail mixes, teas, and on their own. A small handful a day is the recommended amount. Still my favorite food, raspberries are also rich in antioxidants, high in vitamin C, and a good source of dietary fiber. They contain a fair amount of manganese, vitamin K, magnesium, and folate among other nutrients. The nutritional profile of raspberries results in anti-cancer properties, anti-inflammatory benefits, and recent research is showing their ability to help with obesity and blood sugar issues. For more info on this tasty fruit, click here. Rounding out this smoothie recipe are two more superfoods, coconut oil for some healthy fats and bee pollen, rich in vitamins, minerals, and amino acids. Note, this smoothie isn’t very thick. For a thicker, creamier smoothie simply add a banana or half an avocado. Enjoy! Place all of the ingredients into your high-speed blender and blend for around 30-45 seconds or until your desired consistency is reached. I’d love to hear what you think of this goji raspberry superfood smoothie – please leave a comment below. Happy Blending! I find it’s sweet enough without a sweetener but agave nectar would be my choice. Spring and coconut water are where it’s at, and chia seeds are the bomb!